Boats are not cheap, they’re very expensive bits of equipment and therefore we should try our best to protect our precious investment. When storing your boat for a long time, rodents and insects could find their way into your storage and damage your boat. 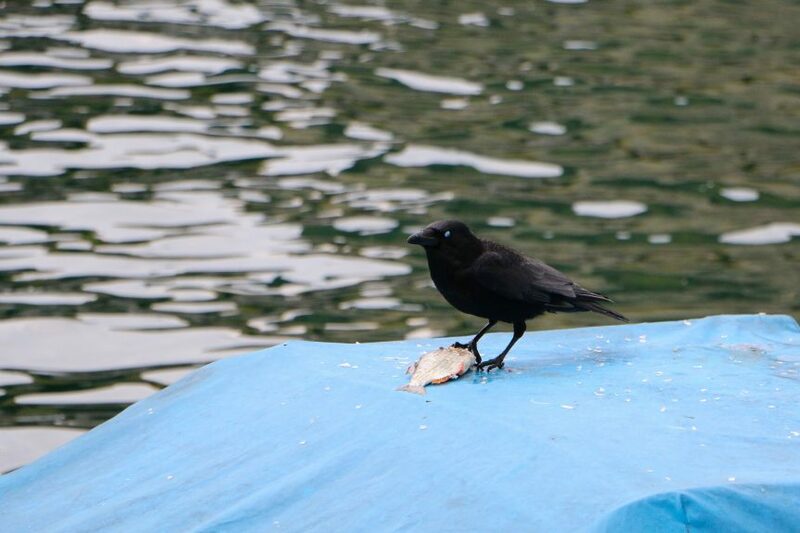 Rats and termites are notorious for eating away at boats while they’re in storage. This makes it important to ensure that your boat is protected whilst you’re gone. In this article I’ll be reviewing and comparing the best pontoon boat covers with snaps on the market. It’s not only rodents and insects that you have to worry about. The weather could also be devastating to the health of your boat. This makes it vital that you purchase a pontoon boat cover. 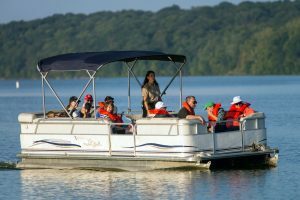 Pontoon boat covers are sheets or material that you cover your boat with to protect it from damage. If you have money to spend and want a customized cover which will match your boat, then you can have a custom canvas produced at a canvas shop. This is likely to set you back at least a thousand dollars. Though, if you just want a high-quality cover which will keep your boat safe for a cheaper price then this list will be perfect for you. Without doubt, this must be the best pontoon boat cover on the market. This is an outstanding boat cover that comes at an extremely low price. After reviewing a wide range of different covers, I’ve concluded that this is my top pick. You won’t get much better value for money than this. I’ll be mentioning a few reasons why this is such a great cover and should not be overlooked. Firstly, this product is made from very high-quality 600D material. Not to mention it features PU coating technology which maximises its water resistance. This is very useful as it increases the life-span of your cover. It also features double stitched seams and elastic hem. One of the main benefits of this cover is that it is completely elastic, sort of like a mattress sheet. This makes it very easy to put over your boat. You can have you boat completely protected in less than a minute. I’ve had some horrible pontoon boat covers that are a pain to install – however this one is perfect! This cover also has a quick release buckles and strap system. This aids in the process of installing and uninstalling the cover. Another great thing about this cover is that it comes with a bag to store the cover in when you’re not using it. This is useful in keeping the cover safe and keeping it in good condition. Thus, increasing the life-span of your product. One thing which you should keep in mind is that this cover may not be suitable if your boat has protruding canopy in the middle. As well as this you’ll need to bear in mind that any large items such as a retracted Bimini top or captains chair could impair the covers capability to cover the whole boat. This is another great inexpensive pontoon boat cover which provides amazing value for money. This must be my second favourite cover after the Yescom cover. There are virtually no cons to this product, though I’ll touch on that soon. Just like the Yescom cover, this boat is manufactured from a 600 Denier polyester waterproof and breathable fabric. This is a very strong material which will protect your boat from any rain and heavy winds. This cover features elastic around it’s edges to make it nice and easy to install onto your boat. The material is also UV treated to provide long term protection. Many pontoon covers are just too much of a headache to install however this cover features a ‘QuickSnap’ strapping system. The QuickSnap strapping system allows for quick and easy fitting. Quick release straps also make it very easy to uninstall, allowing you to prepare your boat for water as soon as possible. Another great little feature of this product is that it comes with a free storage bag. This is nice to have as many covers won’t come with a storage bag. This saves you from having to purchase your own bag. It’s always great to save a little bit of money. There are only a few drawbacks to this cover. The only complaints I’ve found was that the cover doesn’t last very long. This seems to be a durability issue. Despite this, I’m sure this product will last you a long time if you maintain and use it properly. This wouldn’t be a good list if I didn’t include this amazing pontoon cover by Brightent. It had to make the list, simply due to the great value for money it provides. I’ll tell you exactly why this is such a great product which you should consider purchasing for your boat. This cover comes in a few different sizes, so you should be able to find the appropriate size for your boat. You may have noticed that all the products I’ve recommended are made with 600D polyester. This is simply because it’s such a high-quality material. This material is marine grade and provides outstanding water protection as well as sun protection. This is important to have as prolonged exposure to the rain and the sun can damage your boat. Not to mention this cover also has double stitching, this will make the cover more durable. I haven’t been able to find any drawbacks to this cover. Of course, every cover has the odd review every now and then that the cover didn’t last very long. Though this could be because people are misusing the cover. This product should last you a long time if you use it properly and it’s not exposed to extremely harsh weathers. Obviously, the cover will last longer if your boat is stored in a quiet location, compared to a location with hail and storms. Another great pontoon boat cover is the Armor Shield by Pyle. Overall this is a very high-quality cover which comes in an array of different sizes. This should make it easy to find the right product for your boat. This product is built from 300 Denier Polyester, compared to the other covers which I’ve recommended which are 600 Denier. 300D is a lot more lightweight than 600D which is more heavy duty. This means that this cover should be more flexible, lightweight, and smoother which will make it easier to install onto your boat. Though, this also means that it’s less durable and may not be as efficient at protecting your boat. Despite this, the cover features a double-stitched seam which will make it more durable and increase its weather protection. There are few complaints about this cover though I’ll highlight the few that there are. Some reviews mention that due to it’s lightweight, it’s not suitable for harsh weathers. This may be something you should keep in mind depending on your location. Another complaint mentions that it doesn’t have reinforced areas for support holes.